Enjoy a special menu in the Ocotillo Café. Due to a special event, Ironwood Terraces will close at 2:00 p.m. on Saturday April 27th, 2019 and reopen at 11:00 a.m. on Monday April 29th, 2019. A casual multi-station food court, offering a complete menu including children's items, open every day. Offering relaxed and casual dining, open seasonally for lunch in winter and spring, and for dinner on Cool Summer Nights. We focus on locally sourced ingredients to create regional southwest cuisine. Reservations not required, but suggested for parties of 8 or more. 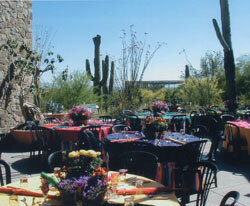 Please call 520.883.1380, Ext 7212 to make your reservation. Offering hot and cold drinks, pastries, sandwiches, ice cream and other snacks. Snack shop offering hot and cold drinks and ice cream. There is a small public picnic area just outside the Museum's entrance. Outside food is not allowed on Museum grounds, except to accommodate food allergies/intolerances or religious restrictions.